What do you mean? Do you mean to wish me a good morning, or mean that it is a good morning whether I want it to be or not, or that that you feel good this morning, or that it is a morning to be good on? Having read both The Lord of the Rings and The Hobbit, I know that Tolkien’s prequel to his epic fantasy trilogy was directed more towards younger readers. I distinctly remember finding The Fellowship of the Ring incredibly difficult to read, but I found The Hobbit quite easy and personally more enjoyable. Jackson's adaptation captures the same vibe that Tolkien created back in 1932 to a tee. I am very impressed. 60 years before Frodo begins his quest to destroy the “One Ring”, Bilbo (Frodo's uncle) begins a quest of his own with thirteen unlikely companions. His travels take him through beautiful and terrible Middle Earth towards the Lonely Mountain in an attempt to recapture the dwarfish kingdom of Erebor. This is one of the most well-polished films that I have ever encountered. It is beautifully crafted containing unreal screenplay, well developed cinematography with amazing and realistic CGI. Peter Jackson's sense of direction married with Tonkin’s unmatched sense of creativity and storytelling results in one of the most successful movie/book franchises in the world. New-Zealand is made of picturesque mountains and forests and lakes and grass lands, making it the ideal setting for Middle Earth which has been beautifully harnessed by Jackson, bringing it to its full potential. Characters have been strongly developed in this film. The classic Gandalf and Elrond need no introduction but new characters such as King Oakenshield are perfect. The book features a very different Oakenshield to the one Richard Armitage portrays, but I think I like Armitage's character better. I have always admired him as an actor but it's nice to see him finally play a major role in a feature film. Thank you Jackson!! We have meet the character Bilbo before in The Lord of the Ring Trilogy but this time we encounter a much younger, chirpier Bilbo who is still discovering himself. It is the exact same Bilbo from the books and Martin Freeman is great. 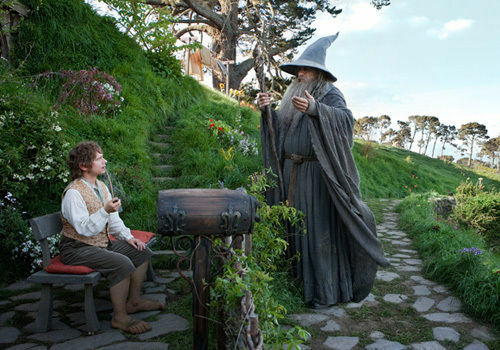 Ian Mckellen once again delivers a marvellous performance as Gandalf and you can't help but love Andy Serkis as Golum! Amazing, scary and entertaining. Before viewing this film, I questioned why Jackson feels the need to break this relatively short book into three films, but now I see. The story of the Hobbit has only just begun by the end of this film, because Jackson has spent so much time developing a Middle Earth that is quite different to the Middle Earth we have previously encountered which he had done soooooo well. Characters, setting, plot, have all been set into place and I am excited for the next two instalments. I can't compare The Hobbit to Lord of the Rings, because although the feature similar settings and some similar characters, they are two very different films. The Hobbit is more comedic, less intense and obviously targeted at a younger audience. But it works. I was so impressed with this extremely polished film which I have waited for since the age of 4 when my father and I would sing the songs the dwarfs sing in Bag End. I had high expectations and it certainly didn't disappoint.